Today terminators are increasingly interested in the countries of the former Soviet bloc, because they can make good money there. 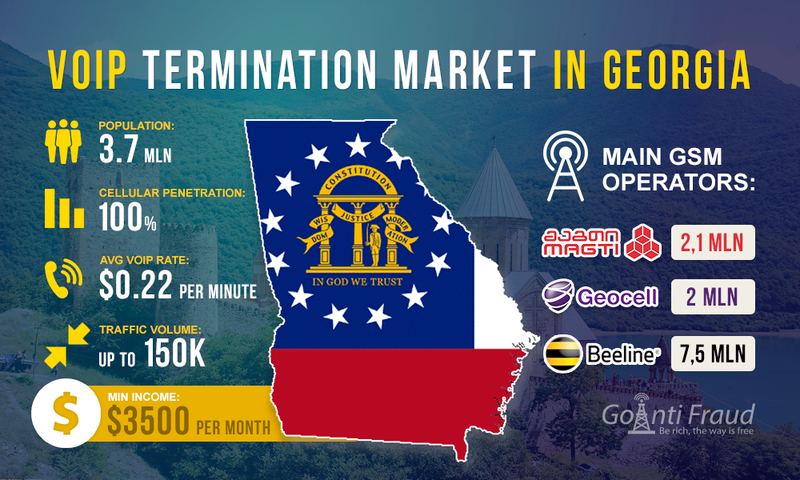 Recently, the forums discuss Georgia and its potential for termination. Based on economic indicators, Georgia is ahead of many CIS countries, for example - business indices of GDP. The country occupies the 76th place among 210 countries. The area of Georgia is 69,700 km², with a population of 3,729,500 people. Despite the fact that part of the area is the sea and the mountains, the connection is excellent even in the most remote places. Experts note the 100% GSM coverage in Georgia. Almost the entire population of the country use mobile phones. The leader in the number of subscribers is Geocell, a little behind is Magticom, and only in third place is occupied by Beeline. The first two operators compete with each other. Beeline is inferior to them in regard to quality and number of subscribers. Another important issue for the termination GSM Georgia is the migration of population and tourists. According to official statistics, 25.7% of the population live out of the country. That makes 1.6 million migrants. At the same time, a significant influx of tourists is observed in the last 2 years. During this period, Georgia was visited by 5 million foreigners. This exceeds the population of the country! A number of people willing to come to Georgia is increasing every season. Resort towns such as Gori, Kakheti, Batumi, Borjomi, Kutaisi, Adjara, Kobuleti, Ureki, Gonio and others are especially popular. Accordingly, demand for international traffic landing is steadily growing in Georgia. In December 2011, terminators received 15K per month from transit companies, in 2013 - 40K. In 2015 originators’ supply increased to 70K. In August this year, there were the ones ready to order even 150K of traffic! Demand for termination of calls in Georgia reached its peak in July-August 2016 over the past 5 years. In addition, there is seasonal demand for traffic landing regarding the number of minutes per call termination in gsm Georgia. For example, the period from April to August is very popular. Then the decline comes. Then, there are the ones ready to provide much more traffic in November. And so it goes every year, with a tendency of increase in the number of minutes. This is due not only to the development of the termination business in the country, but also the difference in the amount of international traffic by the season that is due to the influx of tourists in the holiday periods. Terminators should also take into account that voip price per minute in the direction of Georgia - an average of $0.165. When ordering the cheapest packages such as “Say, Hello!” offered by Magticom, «Meti M», «Tariff 1-12» and «Tariff 1-10» by GEOCELL, price per minute of a local call will range from $0,001 to $0.004373. Thus, the income from the termination may reach $0.164 per minute. With the average life of SIM-card 3-5 days and 4-5-hour operation, the income from one channel will be about $ 118.08 (within 3 days). The average profit per month is $3,542.4 with one channel. When you install 8, 16 and 32-channel gateways, your profit will multiply by the above-mentioned number of ports. For higher efficiency of VoIP termination, you connect to GoAntiFraud. It will help remotely control VoIP-devices and provide the migration of SIM cards, as well as allow masking SIM-cards from the AntiFraud systems and, thereby, increase the profitability of your business.